Watch how all my t-shirt are hand crafted. Screen printed in Belgium on Belgian Brand Stanley/Stella. 100% local. I show you how each t-shirt is printed from blank to finished product. I show you how I invest a lot of time and effort in packaging and experience. Each t-shirt is shipped in custom wrapping paper. Each t-shirt has a custom Musketon neck print. Each t-shirt is shipped with Musketon stickers. Each time we (my girlfriend and I) invest a lot of time giving our customers the best possible service by sending them a nice wrapped package. I hope this give you an insight that we don't just sell t-shirts, but an experience. That's why the t-shirt I sell are more expensive than the average t-shirts you can find in H&M (or any other big chain). The Eddy Wally t-shirt is the latest t-shirt in the Musketon web shop. It's a tribute to Belgian icon Eddy Wally. Each t-shirt has the signature Musketon neck label printed inside the t-shirts. "Always wear me on a first date and you will do awesome"
Each t-shirt ships out with a matching sticker of the design printed on the shirt and a Musketon logo sticker. As a finishing touch all orders are shipped out in custom designed wrapping paper to match the items that is inside. 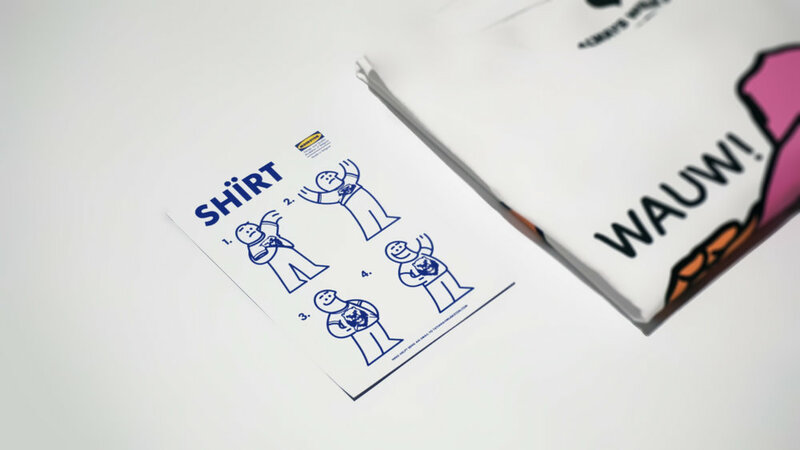 Since we got a lot of emails from people asking how they should use a t-shirt each shirt ships with a manual on how to use a t-shirt. Printing Comic Sans thank you messages on each package.